This article, which I only found yesterday, thanks to my friend Susanne, is slightly dated by a few weeks, but it is an absolutely astonishing document revealing the behind-the-scenes goings on prior to the current cease-fire in Gaza. Italian journalists of Arabmonitor, the first portal of the Arab World in Italy, have interviewed several of the key players who reveal steps Egypt has taken to block Turkey’s efforts at obtaining a ceasefire, their pressure on Hamas to “declare defeat”, the training of special troops of Dahlan in Egypt for a re-entry into Gaza, and the elation that Abu Mazen felt at the news of the assassinatin of Saed Siyam . Shocking reading…. Damascus, January – The high-level representative of Hamas we had the opportunity to talk to chose to remain anonymous, considering the delicacy of the statements he had to make. With but a few hours into the assassination of Saed Siyam in the Gaza Strip and with equally short time left before the opening of the Arab-Islamic summit hosted by the Emir of Qatar, our interlocutor had been granted only two hours of sleep the previous night and his red-veined, deeply sunken eyeballs tell it all. He reveals to us that it’s not Egypt who is actually negotiating the terms of a cease-fire for Gaza, but Turkey: at least, as far as the demands from the Islamic resistance are concerned. That is how we get to know that what the delegates of Hamas obtained from Egypt was not a draft for a cease-fire proposal, but a dictate: a lull in fighting for an initial two-weeks period, in order to allow for humanitarian aid to be distributed in the Gaza Strip and during which the terms for a durable long-term cease-fire would be negotiated. Cairo would actually opt for a twenty-years truce, but surely for nothing less than a fifteen-years duration of it, demanding at the same time the resistance to sign up on an unconditional defeat, to renounce armed struggle and refrain from military training for its members, as well as from producing and importing weapons. During the short-term lull, the two-weeks halt of fire, there would be no opening of border crossings and even humanitarian aid allowed to pass into the Gaza Strip would do so at the discretion of Egypt and Israel. “We thanked them, but explained that it was unacceptable. General Suleiman (head of the Egyptian intelligence) was furious and shouted: Nobody in the Arab world can afford to say no to Egypt”. To describe the kind of game Cairo had been playing from early on in the run-up towards the Israeli aggression (starting 27 December), our interlocutor told us that on 26 December the Egyptians asked Hamas to “raise the white flag”, to declare defeat “and then we (the Egyptians) will intervene with the Israelis to guarantee your personal safety”. In any case, during this talk, which took place in the presence of some of Suleiman’s aides, the Egyptian interlocutors assured the Palestinians they had received guarantees from Israel that no military attack against Gaza was on the time-table. “In these three weeks of war there were days in which for periods of up to 48 hours they denied any passage through the Rafah crossing, even to gas canisters urgently needed by the surgical wards of Gaza hospitals. That’s not all: since about ten days 400 of Mohammad Dahlan’s men (the former strongman of Fatah, the USA and Israel in the Gaza Strip) are guests hosted at an Egyptian military centre in al-Arish (provincial capital of Sinai), where they are being trained by Egyptians”. The plan is for these 400 to return to the Gaza Strip, if not on the back of Israeli tanks, then with the support from Egypt. In recent days the waters of the Nile began to look very troubled, because Egypt did not appreciate at all the efforts of the Turkish delegation to mediate the terms of a cease-fire. General Suleiman initially even prevented the Turks from meeting the representatives of Hamas, demanding that he himself act as messenger between the two delegations. At a certain point, Ahmed Davotouglu, the senior advisor of Turkish Prime Minister Erdogan, ran out of patience and the Turkish delegation from Ankara obtained permission to access the Palestinians. “The Turks went ahead with a quite pragmatic approach. They held out to Suleiman that the Egyptian proposal was, realistically speaking, unacceptable for us and came forward with ideas that would contain guarantees for us as well as for the Israelis. For instance, they proposed to establish a presence of international monitors directly at the crossings, in joint venture with Palestinian forces from the Authority in Gaza, who at the Rafah crossing ­ but only at the Rafah crossing ­ could also consist of a a mixed forces, that is, those of the Palestinian National Authority in addition to our own. According to the Turkish proposal, the international presence would be different from the one set up by the European Union at the Rafah crossing years ago, which practically implemented orders given by Israel through remote control by monitors. According to the new proposal, the forces at the border crossings would act as an independent authority. And again it were the Turks who proposed a time-table of possibly one year for the duration of the cease-fire. We consider Turkey a partner with whom to negotiate, because it has shown much realism”. Among the key conditions proposed by the Palestinian Islamic resistance movement for a cease-fire there is the demand for a complete and definitive halt of the Israeli military operations in the Gaza Strip, the immediate withdrawal of the invasion troops, who “could withdraw within two hours”, but whose evacuation should be accomplished latest within a couple of days, an end of the siege imposed on the area and the opening of all crossings, foremost of the Rafah crossing with Egypt. We asked our talks partner to give us his evaluation of Abu Mazen’s performance during the present crisis. “Listen, shortly after the outbreak of the Israeli aggression he was called up on telephone by the Secretary General of the Islamic Jihad Ramadan Shallah (who lives in Syria, in exile), asking him to make a gesture and to call Ismail Haniye in Gaza, to find out what was going on. Abu Mazen rejected the plea. We know from absolutely trustworthy sources that yesterday, when news reached them at the Moqata (Abu Mazen’s seat at Ramallah) that Saed Siyam had been killed, the political leaders present, among them Abu Mazen, congratulated themselves and handed out sweets. What could I ever say, at this point?”. Abu Mazen’s term as President of the Palestinian National Authority has expired on 9 January. “Yes, but given the current circumstances, we don’t want to create additional problems and prefer to suspend the issue until after the end of the war against Gaza, following which, last not least, we must address the task of reconstruction in Gaza”. Our interlocutor told us that last year, ahead of the Arab League summit in Damascus, Egypt had tried by every means to persuade Palestinian Authority President to boycott the meeting, but Abu Mazen responded: “If I don’t go there, my seat will be occupied by Khaled Meshaal (head of the Political Office of Hamas)”, which was the reason why he went to Damascus (at the recent Arab-Islamic emergency meeting in Doha, from which he remained absent, the seat for the leader representing the Palestinians was indeed occupied by Meshaal). The Europeans also, who in public always took care to present themselves as “virtuous” in avoiding any contact with Hamas, during the past weeks held more than once talks with the Palestinian Islamic Resistance. “Some of them approached us to express their negative feelings over the fact that we, according to them, refused to abide by the existing cease-fire. When we pointed out to them, that is was in fact Israel who violated the cease-fire by refusing to lift the siege on the Gaza Strip, these countries slipped away. However, three European countries kept the lines open and we are still in contact with them. They offered their help to find a way out of the crisis. I can’t tell you the names of two of them, only that they are European Union members, one of them a leading power, and the other one driven by an ambitious policy. The third one to offer us their help is Norway”. Nevertheless, on the American front some interesting developments are coming up. Daniel Kurtzer, former US Ambassador to Israel, who is quite close to Barack Obama’s team, has met twice “as a private citizen” with Hamas leaders. His aim was to “pick up ideas”. The two talks took place in spring 2008 and then again last November, following Obama’s electoral victory. And then, how could we fail to recall that former US President Jimmy Carter had asked for a personal encounter with Khaled Meshal, and with other figures from the Hamas leadership, in April last year as well as in November. Wallah, wallah bismallah, Yakhti alek menenas. Since I hold the incompetent, reckless, corrupt, ruthless and failed Egyptian leadership for losing the war in 67 and putting some 4 million Palestinians to a life sentence in Israeli jails. Mr. Suleiman should be the last one to talk about Egyptian role. It was Egypt failures that put us where we are in the first place. It was Egypt that gave the support and sponsored a failed leader like Arafat. So please let us not hear about what Egypt contributed to the Arab world in the last 50 years, nothing but total failures at all levels. With the exception of the television series Hajj Metwali, Om- Kolthum, Abdul-Haleem Hafiz, and Farid, and Samia Jamal, Taha Hussein, Aqqad, Mahfouz, I do not see the Egyptian leadership contributing any thing of value to the Arab world let alone to the Palestinians. When Egypt ran Gaza they made such a big mess of it, and that is why the Gaza people never recovered from their trauma. Even their Al-Azhar should be discarded as source of retardation in the Islam. Dan Kurtzer ( for Obama) met with Syria and Hamas twice? That is the biggest news here. It was Turkey who was brokering the ceasefire, not Egypt. 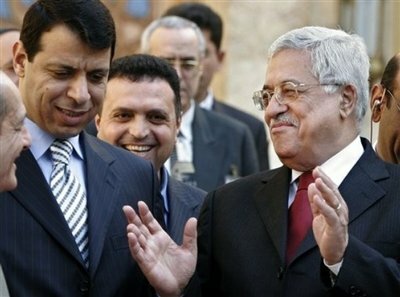 Dahlan’s forces were being trained and it was requested of Hamas to “declare defeat”. Would a foreign entity anywhere else be so audacious as to tell the party that obstensibly was under attack to declare that they were defeated and to then surrender or capitulate without a mandate for this from their own constituency? there are actually other interesting tidbits, but if you can’t find them, I can’t help you out much more. What does he base this claim on? Egypts cooperation with israel??? I am north african but Fortunatelly not Egyptian .I am not racist but rather realistic ,what the Egytpian Arab nationalism concept bring to us. In merely 60 years bring us nothing , nada , niente,.Just look to the egyptian culture in whole , stupid music, rubbish cinema, and so bavardeur intellectuals.I worked with egyptians , and franklly speaking, they disregard all other Arabs.Think about it since when the Egyptian lead the Arab world in history.Never , until this century, and the result is ZERO like them.They always being dominated by other powers, Turks, Memlukis ( they are Turks , and it is them who stopped the Monghols), the Fatimides from Tunisia, Omeyyads, Abbasides.etc, etc.I always hear from Egytpian that they are the best soldiers on Earth, yes they can be but for sure they are the worst Leaders the Great Arab nation could have. At last and not least , If Egypt were the Mother of the World then We are the Father of the World which mean that we her Husband . The Arab world is greater than the ability of Egypt could bear.